One of the best parts of summer is the simplicity. Your shoe collection is pared down to flip flops, your makeup routine is reduced to sunscreen and your wardrobe is pared down to a bathing suit and whatever you throw over it. The same goes for design. Summer months call for a pared down version of our decorating selves (see Miles Redd's simple summer retreat vs. his full time abode). No where is that more apparent than in homes that are designed to be used during these fleeting months. As I was perusing my summer magazines (ok, and Instagram) full of gorgeous vacations homes I noticed a trend: the hook and grommet window treatment. This new-to-me style embodies the spirit of easy summer decorating. 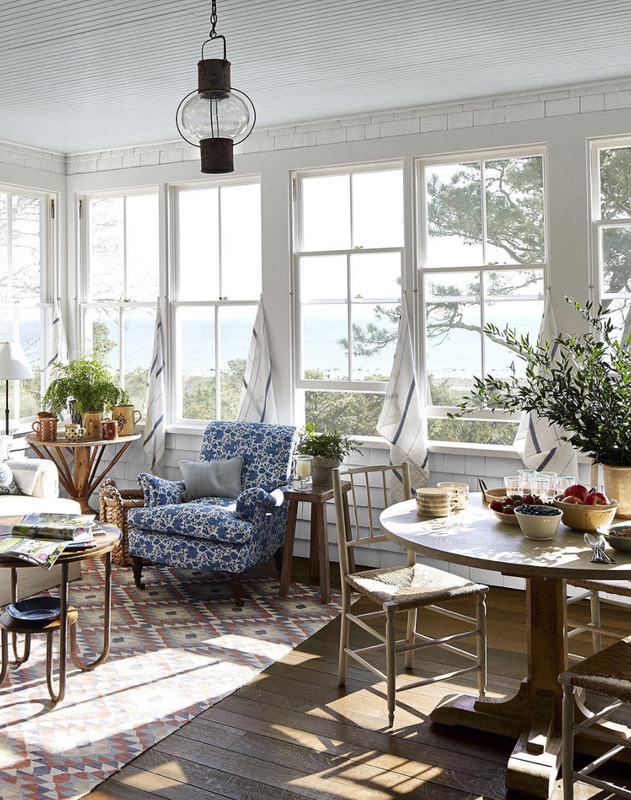 A bit of background (and credit) I first noticed it in the latest issue of House Beautiful (pictured above) where decorator Liliane Hart lined the porch of a Massachusetts home in simple white and blue striped linen. Then later, I saw it in an Instagram post by Elle Decor's EIC Whitney Robinson from his visit to Ken Fulk's Provincetown home. Oh the Internet. The idea is simple, two hooks, a piece of fabric with two grommets and you're done. Hang them up when you want a bit of privacy, and leave them down the rest of the time to enjoy those moments in summer when the inside feels like part of the outside. I'll admit this look should be handled with care. It does run the risk of looking like a dorm room in the wrong context, but in these cottages (and capable designer's hands) it's simply (or should I say simple?) perfection.